A week ago the college football world lost an iconic and legendary player. 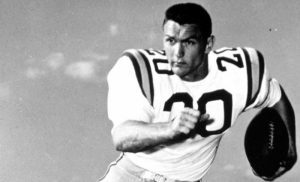 The Great LSU running back Billy Cannon passed away at the age of eighty years old. Billy Cannon was a force to be reckoned with on the football field and as difficult as it was to bring him down on the football field, it was just as hard to bring him down in life. To say there will never (ever) be another like the great #20 at LSU would be an understatement of Biblical proportions. A lot has been written about the great Billy Cannon this week and there is certainly nothing I can add to his many accomplishments that would further amplify his extraordinary feats on the football field. There was “The Run” on Halloween night against Ole Miss that won the game for the Tigers and launched them into the National Championship. Certainly there have been many other noteworthy plays while he was at LSU and many more to in Professional Football that would further add to his legacy as one of the greatest running backs of all time. But like I said earlier there is nothing I could write that would make Billy Cannon larger than life, because he already was and always will be. I want to say a few words about “The Man” because so many national pundits in the sports media this past week couldn’t help but recall at nauseam the troubles of Billy Cannon in life after football and fewer still talked about Billy Cannon’s honesty in facing those troubles and resurrecting his reputation. The measure of a person isn’t the troubles that befall them in life; it’s what they do in the midst of those trials and tribulations that define who they really are. The Great Billy Cannon was hard to tackle on the gridiron and even harder to keep down in life. He never fought the allegations against him, and didn’t complain when the College Football Hall of Fame removed him from the list of the great names enshrined there. He was forced to loan out his Heisman trophy for money…. But in a word….He took it all like a man. Let me tell you dear friends, if you live long enough you will indeed have trials and tribulations and some of those will be your fault and some will be forced upon you. Billy Cannon was later reinstated into the College Football Hall of Fame with his reputation intact and repaired due largely to his character in adversity. Billy Cannon was difficult to emulate on the football field with his bruising running style and I would also argue that he is equally difficult to emulate during the storms of life. Do you run to the sideline after you have been tackled from behind or taken a cheap shot? Do we tell ourselves it’s time to quit and just give up because things have gotten hard? The world lost a legendary football player this week in Billy Cannon, but worse still we lost one hell of a man. God Bless you Billy Cannon and thank you for the memories and the lessons in life.